Dr. Jon Coles, 2017 Doctor of Philosophy with an emphasis in Sport Management, is a tenure track full-time professor at Grand Valley State University. 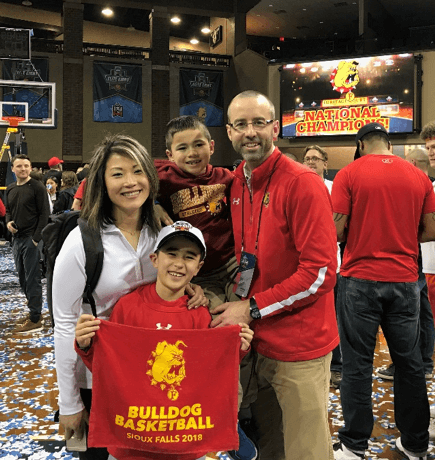 As the father of two small boys who are very active in sports, Dr. Coles shares how the flexibility of NCU's programs helped him balance family life, work, and school. 1. Tell us why you pursued a doctorate degree in Sport Management? Having served in various capacities within sports for over 20 years, I have seen parenting change. I played collegiately, coached collegiately, have served as a high school athletic director, and most recently a collegiate athletic director; therefore, I have seen the whole spectrum of parental involvement in sports. Having two kids of my own now who are entrenched in sports, this topic was intriguing for me for a variety of reasons, both professionally and personally. So for current and future sport parents and myself, I wanted to know what current college athletes thought was the optimal level of parental support and/or push. 2. Why did you decide to go back to school; what drew you to NCU? During my approximately 20 years working in the sport management industry, I got the greatest satisfaction and motivation from watching my students and interns succeed. Therefore, I knew I would love teaching and started to pursue my PhD while working in order to teach. After defending in December, I applied for a job a couple months later, interviewed, and accepted, not even 8 months after defending my dissertation. 3. What are some of the most difficult challenges you faced as a student and how did you overcome those challenges? The most difficult challenge was the dissertation. I was well aware of the statistics that around 50% of people who start PhD coursework, don’t finish. Therefore, I knew it wouldn’t be easy. Luckily, I chose a topic that I was deeply interested in and even greater than that, knew I could create change with the findings of my research. That’s what kept me grinding; the fact that I knew my work could be an agent of change. 4. Did you have any mentors who guided you throughout your dissertation journey? Dr. Tom Pucci, Associate Dean of Students, was awesome as an advisor. He was resourceful, motivating, and knew how to jump through the hoops. 5. How has the flexibility of NCU's programs helped you balance family life, work, and school? My wife owns her own optometry practice, we have two young boys in every sport imaginable, and working in collegiate athletics required a ton of hours. NCU’s structure allowed me to work from home from 9-11pm most nights (after putting the kids to sleep) and not interfere with my daily 7am-9pm routine.